The ability of plants to turn sunlight into energy through photosynthesis has been successfully mimicked by scientists at the University of Southampton to produce a new generation of solar cells. The Southampton team led by Professor Pavlos Lagoudakis of the University’s School of Physics and Astronomy, has developed a new range of photovoltaic devices that use a process found in vegetative methods of light harvesting, to deliver unprecedented amounts of electrical current from light. In photosynthesis each molecule has evolved to deliver a function that complements the perpetual cycle of light to energy conversion. With the advent of nanoscience, scientists are now able to build devices of multiple nanoscale components, each one designed to deliver a specific functionality. 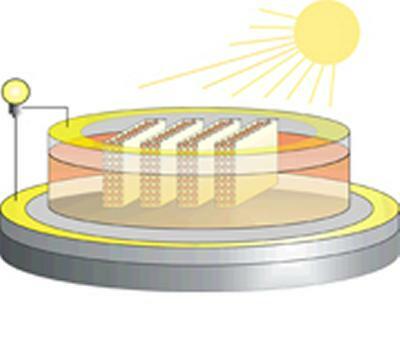 Professor Lagoudakis comments: "We looked at the ways that energy is funnelled in nature and through reverse engineering, using multiple nanoscale components, we designed and fabricated a hybrid photovoltaic device that can absorb light and efficiently convert it to electric current. "These are early days but the possibilities for the application of this technology for environmentally-friendly energy production are very exciting." The work was undertaken in the University of Southampton’s Laboratories for Hybrid Optoelectronics.